CHICAGO, Feb. 7, 2019 /PRNewswire/ -- Many building owners around the world know they need a Digital Twin strategy but aren't sure how to get started. IDC recently noted that by 2020, 30% of global 2000 companies will be using data from Digital Twins to improve organizational productivity by as much as 25%. Still, the path forward for real estate executives has seemed unnavigable — until now. Cityzenith, creators of the Smart World Pro™ Digital Twin platform (as seen on the BBC), has launched an innovative new "lite" version of its flagship product that helps any building owner get started with a Digital Twin solution of their own in only a few weeks — and realize immediate short term value while building a foundation to generate significant long term future returns. It's called the Digital Twin Starter Kit for Building Owners. 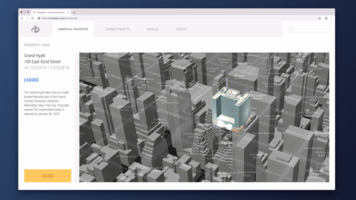 The Digital Twin Starter Kit for Building Owners provides users a personalized digital portfolio information map of all of their properties, portfolio-wide — embedded directly in their own website. A next-generation property information "supermap," the Starter Kit will replace the 2D maps and static photos typically found on property websites with an entirely new experience that's far more data rich and interactive. In today's data-driven world, buyers and tenants demand access to more data than ever before to make a buying decision, and the Starter Kit aims to help real estate companies provide it to them. Navigate from a complete portfolio overview of all of your assets — existing and in design or construction — to a single property, anywhere in the world, and see a wealth of information, including but not limited to property photos, AR environments, 3D images, drawings and plans, renderings, live video feeds of real-time construction progress, Matterport tours, and more. Investigate information around any of your properties: live and historical traffic, zoning regulations, property transaction data, building permits, county parcel records, civic monuments, IoT and sensor data, places of interest, ATMs, restaurants, schools, hospitals and more. Ask interactive questions and search for detailed information about a particular property and the surrounding area. For example, "Show me all the buildings in this portfolio in the Chelsea District of New York City with over 40 stories built in the last 5 years," or "Show me all the ATMs within 1 mile of this property." CEO Michael Jansen explains "We understand that for many building owners, there's a misconception that implementing a Digital Twin strategy is a complex, cumbersome process. It could well be, especially if you tried to do it on your own without core technology and a dedicated Digital Twin solutioning partner. Digital Twins are not out-of-the-box products: they're customizable solutions that evolve. The good news for owners is that they can start simple and be effective from early on. The Starter Kit provides owners a "quick win" Digital Twin solution in no time, transforming their new twin into a powerful sales and marketing tool, while providing a platform upon which to scale into the future. And we are right there with you to ensure you succeed. We don't have customers; we have partners. We work interactively and collaboratively with our partners daily until they have what they need. That's our guarantee." For more information about how to get your own Digital Twin Starter Kit, please contact Andrew Penney at a.penney@cityzenith.com. Cityzenith is based in Chicago and London. The company's Smart World Pro™ platform was created for people designing, constructing, and managing complex, large-scale building projects, properties, and real estate portfolios. Learn more at www.cityzenith.com.